Giverny is a small village in Normandy, 75 kilometers northwest of Paris. 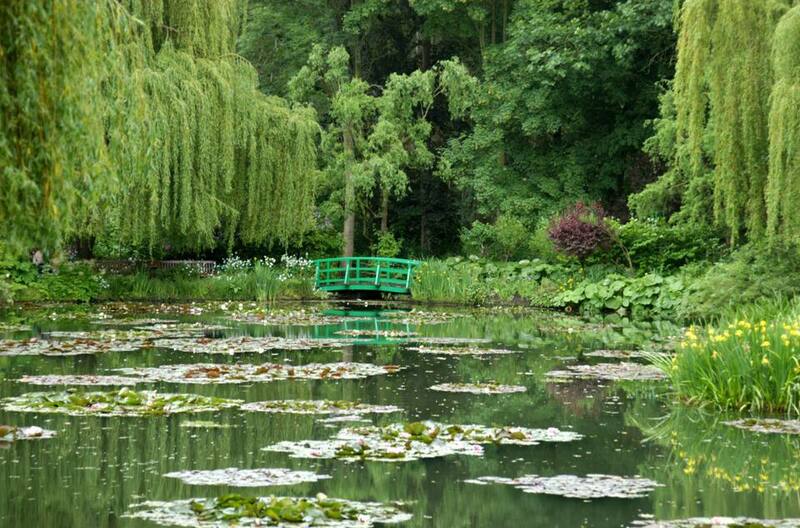 Giverny is home to Monet's Gardens, an extremely popular place to visit, especially in spring. You can tour Claude Monet's house, then go out to see the gardens which inspired his paintings and experience Giverny's 'special light' that influenced the work of Monet and other impressionists. Surrounding Giverny are several forests in which you can walk or bike. Most travelers hit Giverny in the spring—April showers bring May flowers, after all—and then the tourists give the gardens a rest in the heat of summer. Fall is also a very active time for the gardens, and there's still a lot to see. Despite its small size, Giverny hosts many festivals throughout the year. In September, the big Giverny Festival comes to town. As there is no train station in Giverny, those without a car might prefer to take a guided tour. There are options for half-day tours and biking tours. Versailles and Giverny are about an hour apart by car and it is only a slight detour to head west first to Versailles and then north to Giverny. This creates the opportunity to do a combined tour of the two attractions. While there is no train station in Giverny, there is one four kilometers away in Vernon, and you can take a bus from Vernon to Giverny during the high season. Alternatively, there is a taxi stand in front of the Vernon station, where you can get a taxi to Giverny for under 20 Euro. To get to Vernon from Paris, depart from Gare St. Lazare. Vernon is on the Paris / Rouen / Le Havre line. If you wish to go directly to Giverny by bus, inquire as to which trains are timed to meet the bus to Giverny in Vernon. Vernon itself isn't a bad place to visit or to stay for a few days. The Vernon Museum is where you can see many of Monet's paintings. It is located at 12 rue du Pont in Vernon and houses everything from an archaeological collection to military and fine arts exhibits. While in Vernon, you can rent a bike at the train station or at the bike shop "Cyclo News" near the hospital. There is a special trail that gets you from Vernon to Giverny without having to take the highway. You simply take Albufera street and cross over the Seine, then ignore the signs to Giverny (that's the highway) at the roundabout and go a little past it to the bike and footpath called "Voie Andre Touflet." Give yourself a night in Giverny if you'd also like to visit the Musée d’Art Américain Giverny, which is found at 99, Rue Claude Monet—the same street as Monet's house and gardens. The Office of Tourism in Vernon is at 36 rue Carnot near the bridge. Here, you can ask for "le plan de ville de Vernon" (the map of the city) and inquire about guided tours of Vernon, Giverny, or the surrounding area called "Pacy-sur-Eur." The web site in English is loaded with further information on the area. Look into staying at either La Pluie de Roses, which is right on the Rue de Monet at number 14, and Le Clos Fleuri in Bonneville La Louvet—both come highly recommended.